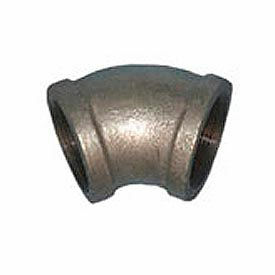 45° Elbows Galvanized Malleable Are Used For Commercial And Residential Plumbing Applications. 45° Elbows Galvanized Malleable are constructed with corrosion resistant 150# galvanized malleable materials for long lasting durability. Allows for changing pipeline direction by 45 degrees. Sizes vary from 1/8 in. to 4 in.. Connection type is FNPT. Color finish is Gray. PSI is 150. Package quantity is 1.